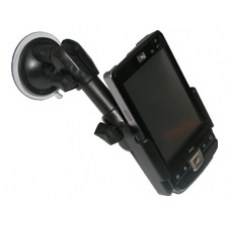 This heavy Duty iPAQ car holder is a PDA mount ideal for keeping your iPAQ 200 series Enterprise Handheld safe and secure on your dashboard or windscreen. Utilizing your iPAQ as a satellite navigation or GPS unit has never been easier with these model specific holders - simply slide your iPAQ device in the mount and you are ready to go! Constructed in Germany from the highest quality ABS plastics, the mount system is highly flexible with both 360 degree rotation and an extra long barrel to allow for complete iPAQ comfort and security. The suction mount holds your iPAQ unit safely on the dashboard or windscreen, remaining vibration free, without saving on flexibility.iPAQ shown for illustration purpose only and is not included. * No Compromise High Quality European Made. * Included Extra Long Barrel, can be set to 7.45 inch or 9.45 inch.